One of the first few frames of the day. Really sets the mood in the right direction ! We did this shoot many moons ago in July 2013. As usual I was archiving my old stuff and stumble upon an unfinished project. The thing was, we were suppose to meet up later for more shots as I only had a very limited time with the car. Two years later, here we are. Hes busy, I'm busy. Time flies. This yellow beauty is my friend, Firdaus's pride and joy. He is the third owner for this 1975 classic the Toyota Celica TA22 ST. I was keeping this car for a good place to shoot, finally I found one. A unused warehouse. Which I borrowed from the owners for one day for shooting this special car. 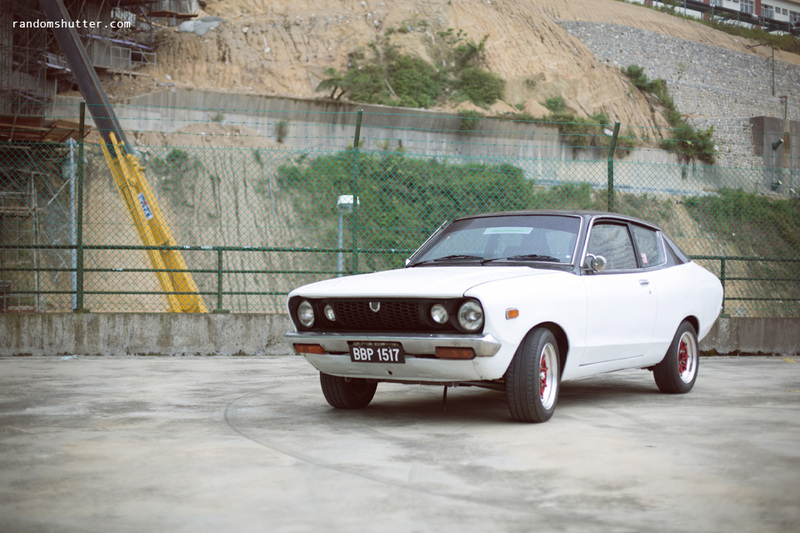 Few weeks ago I had the opportunity to drive up to Genting Highlands in an awesome classic Datsun. Thanks to a Kean Yap who hooked me up with this awesome ride. It was such a coincidence that during this my trip the BwB guys were organising an event to convoy up to Genting Highlands, and interestingly had an extra car which I drove up in. Initially I wanted to follow up, so I can take some photos and maybe some videos along the way up. But I was driving, which was even more awesome. And after the convoy, we were a CLUB (if you drive a classic, we want you!). Looks like many clubs are getting it on in Kuching these days. Good sign! Okay, so as per usual it started way early in the morning. The convoy gathered at the usual meeting place and was suppose to start going at 7.00am. I arrived at 6.50am. Umm.. haha! So I did not manage to capture much photos at the gathering place. After a good hour of driving we finally reached Serian. We kind of caused a scene by showing up in such volume and variety. haha. Becaused we were parked between the only petrol kiosks there, most heavy trucks and such could not get to their fuel~ haha ! Moke! This ride is so cute! Fast bugs! Could not catch up! It was difficult to take any photos with traffic slowing down to admire all the classics on display. So after 15 mins I gave up trying >_< and headed for morning coffee at a nearby kopitiam. Then it was decided we should continue the journey to Ranchan Pool. Some decide to head back to Kuching by this point. Serian to Ranchan Pool is just a 10 mins drive away. Have not been there in ages. If I had known we were headed there I would have brought my towel and have a go in the pool! So while everyone was busy resting under the shade. I was out trying to capture some images. Turns out I did not take as much as I imaged. =\ Or hoped. Then we all decided to head back down to Kuching. With a slight detour unknown to many. We actually stopped at Siburan, community hall or something. Didn't know it was open for public I just followed in. :) Loved it because finally, out of the SUN! Very mint Mini. Love the er... colorful color! Hmm.. very mint fresh! While we were lining up the cars for a group shot. We seemed to have attracted a large crowd. People were piling in and taking posing and taking photos with the car. Haha it was a real slight. It was fun. Took me a while to complete the video, as I shot nearly two hours of footage, and had to compile it into under 10 mins video. So enjoy it. Play in HD if your connection is fast enough. Warning: The video gets very dizzy in the middle (4 minute mark on wards). Sorry about that, I was under the influence of flu medication when I was editing the video. So that concludes our little trip on an early sunday morning. Thanks for taking the time to read, if your interested to join us with your classic ride. More photos at club facebook gallery. And some more at my facebook gallery.